Are you getting maximum results from your visual content? Do you use fonts, colors and clever effects to make your company’s images more recognizable? Graphics that are consistent with your company’s established image increase your audience engagement by creating familiarity. In this article you’ll discover how to use simple design tactics to help your audience instantly associate your pictures with your brand. 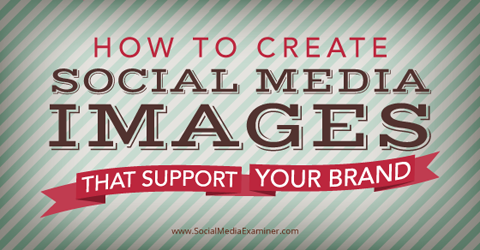 Find out to create social media images to support your brand. Determine a minimum size for your logo and apply it consistently across your social media images. Your logo should never overpower your design, but it’s also important that it isn’t too small. Keep the positioning of your logo consistent for the majority of your graphics—the best rule of thumb is to put it in the bottom right corner. This ensures that the logo isn’t too distracting but still associates the product with your brand. 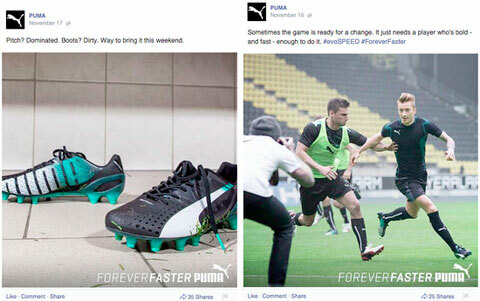 Puma’s logo doesn’t distract, but still reinforces the brand. If you need to change the size or logo placement to suit a particular kind of design, make sure it’s center-, right- or left-aligned. Many people like to use text overlays as headings, subtitles and body copy. If you’re one of those people, choose no more than three fonts and use them throughout all of your social media graphics. For increased recognition, use the typeface most commonly associated with your brand. Nike does a great job of this on its Facebook page, using its iconic bold uppercase font for the majority of its social posts. Nike’s font is easily recognized worldwide. If you aren’t using your brand font (or don’t have one), you can use script, uppercase or handwritten fonts for your header (just make sure the header is readable). Keep font combinations for your title, subtitle and body copy consistent. A popular option for subtitles is to use the same font as your heading, but at a smaller size or with a different style (e.g., bold or italic, or increased letter spacing). You can use a completely different font for body text. If you look at the images of any well-known brand, you’ll see that they use the same colors repetitively—in their logo, in their text, even in their images. That consistency is what helps viewers recognize the company and evokes certain feelings and emotions associated with the brand. You can apply this same approach to your own visual content by choosing two to four colors and using them consistently. 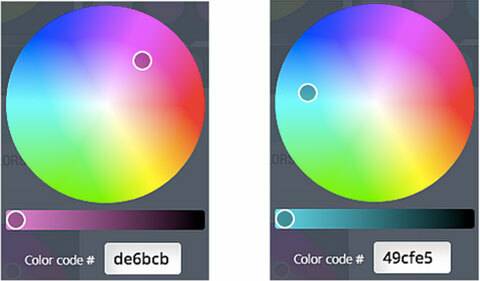 You can find and save your brand colors using hex codes, which are the six-digit codes that appear when a color is selected on the color wheel. Identify your brand’s exact colors and use them in all of your visual content. 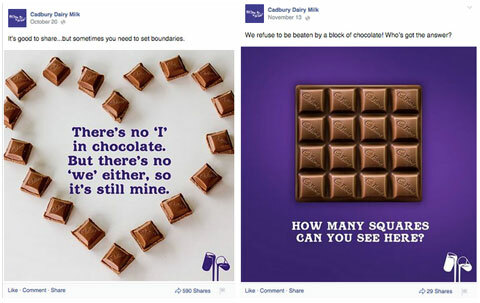 Cadbury uses this technique effectively on their Facebook page, making sure most images use the colors their audience associates with them: purple and white. Cadbury’s Facebook graphics incorporate its iconic purple and white. Not all of your images need to use your brand colors, but aim to use them in at least 50% of your graphics so people begin to associate the colors with you. Whether images are used as a background or as stand-alone posts, it’s important topick a consistent theme. To discover your company’s personality and find images to suit it, ask yourself what product, service or experience you’re trying to sell. If your brand was a person, what kinds of things would it like to do and see? What does your audience respond to? Find images that match your answers. 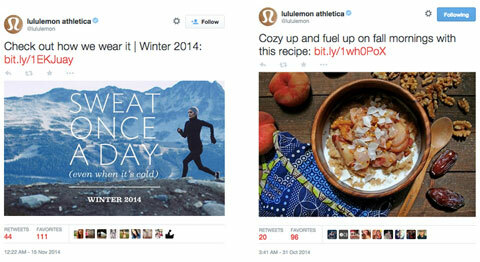 Images used in Lululemon Athletica’s Twitter posts reflect their health-oriented mission statement. For example, Lululemon Athletica uses images on its social platforms that depict outdoor exercise, healthy eating and beautiful landscapes. These pictures reinforce their mission statement: Creating components for people to live long, healthy and fun lives. If you choose not to add your brand assets—like fonts and colors—to your social media designs, branding your images is difficult. One way you can make things easier on yourself is to focus your image on your logo or product. 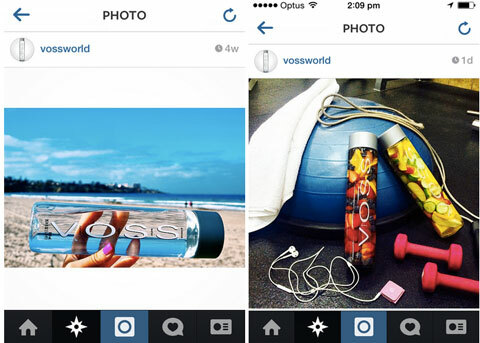 Voss makes their logo and product the focus of their Instagram pictures. Part of clever product placement is being able to identify the right setting. A good way to think about it is to identify the kind of experience you want your product or service to empower—this will help appeal to your target audience. Swedish water brand Voss uses simple images in their Instagram feed to appeal to their target audience. Picturing their bottle at the beach and the gym shows the product as more than just water—it goes hand-in-hand with an experience. Filters give your images an interesting look and feel. Before you start applying them though, consider which ones match your established design elements (like those mentioned throughout this article). Photo filters give multiple images a consistent look and feel. Some filters brighten your images, while others enhance certain colors, so it’s important to have a clear idea about how you want your images to look. When you’ve settled on a filter, use it to create a uniform look for your shared visual content. One way to foster brand recognition is to create a series of templates. Not only dotemplates make it easier for you to create new images quickly, but they’re also great for user engagement. Use templates to create familiarity. When your audience sees your familiar design, they quickly recognize that the image is yours. Fonts, colors and layouts are all design elements that play a huge role in making your company’s images stand out. If one of your social media goals is to increase your brand recognition and drive more people to your business, effective design tactics are your express ticket to success.